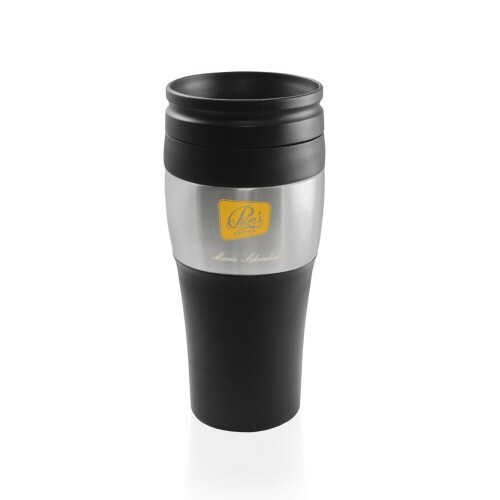 Double-wall insulating tumbler helps keep hot beverages hot and cold liquids cold. 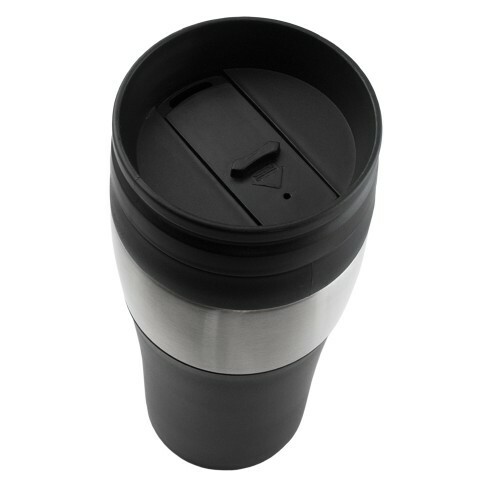 Constructed with BPA-free Black ABS & Stainless steel, featuring a leak and spill-proof design. Perfect to be used on the go or at the office. Holds up to 14 fl oz. Rubberized skid-proof bottom. Fits all standard car cup holders. Hand wash only. Price includes a 1 color, 1 location Pad Print or (Tone on Tone) Laser Engraving. Add $1.00(G) for Oversize Printing. Setup $56.25(G). Upgrade to Oversize Laser Engraving(Oxidation) for $3.12(G). Setup $56.25(G). 4 Color Process (Max imprint: 1 1/2" x 1") - $2.50(G)/pc. Setup $56.25(G). Size: 3 3/16L" x 3 3/16W" x 7 1/4H"
4 Color: 1 1/2W" x 1H"
Carton/Dimensions: 22L" x 15W" x 8H"